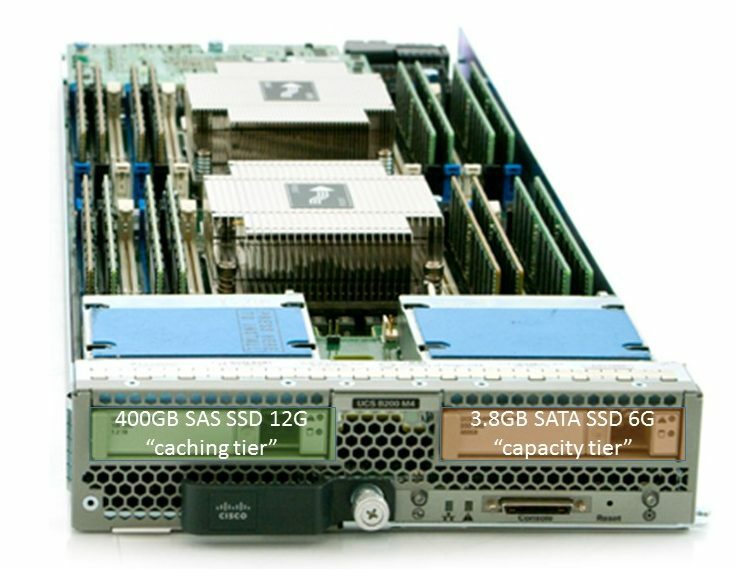 Last month, VMware announced a new vSAN Ready Node using the Cisco UCS B-Series blade server. Blade servers aren’t new to vSAN Ready Nodes (see “VMware Virtual SAN Ready Node on a Blade Server“) and Cisco isn’t new to the vSAN business – they’ve had their UCS C-Series rack servers certified since “Ready Nodes” were announced, so why is this announcement interesting? It’s because it is the first vSAN node that only includes 2 drives. vSAN Ready Nodes are tested and certified server configurations that are jointly validated by the server OEM and VMware. vSAN Ready Nodes provide specific CPUs, memory configurations, network cards, I/O controllers and HDD/SDDs designed to run specific vSAN workloads. They are also designed to be easy to order by the OEM via a single orderable “SKU”. Cisco’s vSAN Ready Node on the UCS B200M4 is listed as an AF-4 providing raw capacity of up to 3.8TB. With AF (All Flash) configurations, VMware requires 4 nodes, therefore you’ll have to have 4 of these configurations to make up the starting cluster. Doing the math, a 4 node cluster would provide you with 96 CPU cores, 512GB of RAM and 15.2TB of raw space. A word of caution, though. When you factor in vSAN Failures to Tolerate (FTT), snapshots, etc. you may find that your actual usable capacity around 8TB so you’ll want to refer to a proper sizing tool, like VMware’s vSAN Sizing Calculator (https://vsantco.vmware.com/vsan/SI/SIEV) to insure you plan for the proper amount of nodes. https://www.vmware.com/resources/compatibility/pdf/vi_vsan_rn_guide.pdf. In fact, I’d encourage you to book mark it as VMware is updating it every couple of weeks or so and with Cisco’s entry into the 2-drive vSAN market, I’m sure other OEMs will follow. Disclaimer: The views presented in this blog are personal views and may or may not reflect any of the contributors’ employer’s positions. Furthermore, the content is not reviewed, approved or published by any employer. No compensation is provided for any part of this blog.